Bloggers from both the right and left sides of the political spectrum united last week in overwhelmingly condemning the House passage of an amendment intended to modernize rules surrounding the dissemination of information. Both sides argued the bill was an overreach of government power, warning it would enable public officials and the military to disseminate propaganda to the American public. But they disagreed over who was responsible. Liberals feared the military and Republicans were trying to expand their influence while conservatives warned that President Obama would employ that power for political means. The issue received negligible coverage in the mainstream media last week, reflecting the libertarian leanings and privacy concerns that are often present in social media. For the week of May 21-25, discussion over the Smith-Mundt Modernization Act was the No. 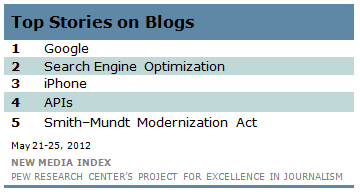 5 topic on blogs, according to the New Media Index from the Pew Research Center’s Project for Excellence in Journalism. Almost all the bloggers who discussed the topic linked to the same report-a May 18 BuzzFeed article that offered details of the bill. While a much smaller part of the conversation, defenders of the bill also came from various segments of the political spectrum. Representatives of a wide range of organizations such as The Heritage Foundation and the American Civil Liberties Union (ACLU) claimed the opposition to the act was based on misinformation and that the bill would make the workings of the U.S. government more transparent. Sponsored by Rep. Mac Thornberry (R-TX) and Rep. Adam Smith (D-WA), the Smith-Mundt Modernization Act would allow Americans to see materials produced by the U.S. government for overseas consumption. The bill would also remove prohibitions which prevented Americans from receiving news from organizations like Voice of America and Radio Free Europe. Supporters also argued that the amendment contained protections so that the U.S. government and the Department of Defense could not use propaganda on its own citizens to improperly influence public opinion. Most bloggers had strong negative reactions after reading the BuzzFeed article. Conservatives charged that the bill was an attempt by the Obama Administration to manipulate public opinion. KrisAnne Hall could not believe that conservative members of congress were supporting the legislation. Liberals, on the other hand, blamed others for what they viewed as an expansion of government power. The outrage led to a response from the bill’s authors who claimed the concerns were a result of misinformation. Rep. Smith defended the amendment on his own website. A few outside observers supported the bill and offered a very different interpretation than many bloggers. Rep. Thornberry tried to put the entire episode into a larger context. Elsewhere in the blogosphere, technology dominated the week’s conversation. Google was the No. 1 subject last week for several stories-some of which portrayed the company in a more positive light than others. Many bloggers linked to news that Google Chrome had overtaken Microsoft’s Internet Explorer as the most used browser on the web. Others highlighted a post on Google’s blog announcing that the company had purchased Motorola Mobility, a move that will help Google in its efforts to expand its mobile device capabilities. On a less positive note, other bloggers linked to a piece on the Huffington Post blog by Professor Erik K. Clemons of the University of Pennsylvania’s Wharton School which chronicled the “legacy of continued bad behavior at Google.” Clemons claimed that Google’s large market share has led them to violate privacy rules and spy on customers. The topic of search engine optimization (SEO) was the No. 2 subject. Many people focused on a column on Search Engine Watch that cited cautionary tales of companies who were making mistakes in their efforts to improve their ranking on search engines. A report about the likely next generation iPhone with a larger screen display was No. 3. Speculation and previews of Apple products have drawn significant attention in the blogosphere in recent years, such as the release of the iPad 3 in March. A blog post on Programmable Web about 78 new APIs available on the web was fourth. API, otherwise known as application programming interface, is a component of software that allows interfaces to interact with each other. Programmers can take advantage of these APIs to automate connections between websites. This specific post highlighted new APIs such as a travel booking service and a wallet checkout service. On Twitter, as is often the case, pop singers and entertainment news made up most of the popular topics. One Direction, the British-Irish boy band, was the top subject as tweets and videos from the group’s tour received the most links. The launch of the SpaceX cargo ship, the first commercially-bankrolled spacecraft to travel to the International Space Station, was No. 2. SpaceX is a private company, founded in 2002, that holds a $1.6 billion NASA contract to launch at least 12 unmanned cargo missions. 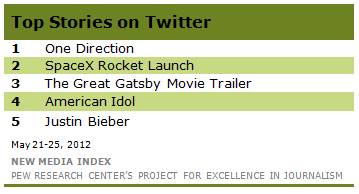 A trailer for the movie version of The Great Gatsby (due out in December) starring Leonardo DiCaprio was third. Stories about the season finale of American Idol were fourth, followed by a video of Justin Bieber performing his song “Boyfriend” on The Ellen DeGeneres Show. All five of the most viewed news videos on YouTube last week were about events that took place overseas. A backhanded slap from Will Smith to a Ukrainian reporter landed the famous actor in the top spot. The May 18 incident occurred on the red carpet at the Moscow premiere of Smith’s new film, “Men in Black 3.” In the video, reporter and noted prankster Vitalii Sediuk tries to kiss the celebrity on the lips, prompting Smith to push him away and give him a light slap. The No. 2 video was footage captured by a Saudi woman in the middle of a heated discussion with officers from the “muttawa,” the Commission for the Promotion of Virtue and Prevention of Vice, in a shopping mall in Riyadh, Saudi Arabia. The woman refused an order from the religious police to leave the shopping mall because she was wearing nail polish. She warned that the video would be on Twitter and Facebook. A detailed description of the NMI methodology, which was recently modified in August 2011, is available here.